When I was in Milan two weeks ago I had a first and second fitting with Ferdinando Caraceni in a day. 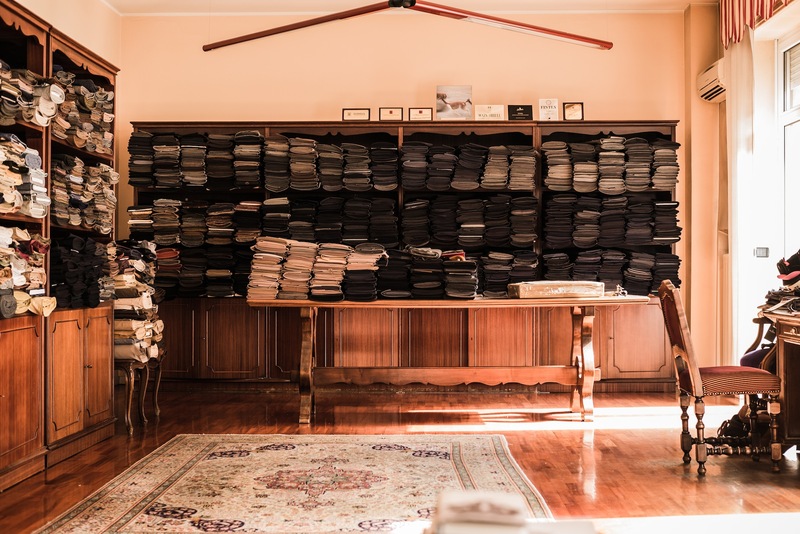 This isn’t something that all tailors are happy doing, but for some such as Caraceni – which has a lot of foreign clients hoping to have suits made in as few visits as possible – it is quite practical. Indeed, it’s interesting the different ways tailors try to minimise a customer’s visits. Cifonelli regularly makes a fitting in waste material on the same day as taking measurements. Reillo in Madrid did this with me also. 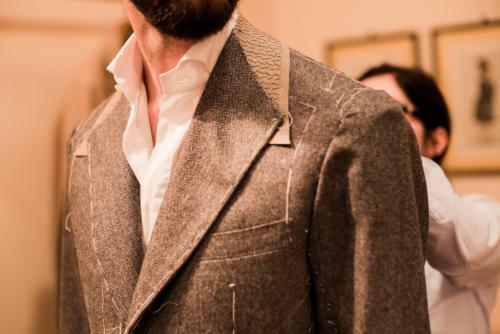 Camps de Luca uses a fitting jacket stitched with a matrix of lines, in order to try and get the balance of a jacket right straight away. All of these tailors are trying to achieve the same thing: get the fundamental balance right (front to back, side to side) so it doesn’t have to be adjusted at the basted fitting. Caraceni, on the other hand, prefers to have two stabs at the basted fitting. 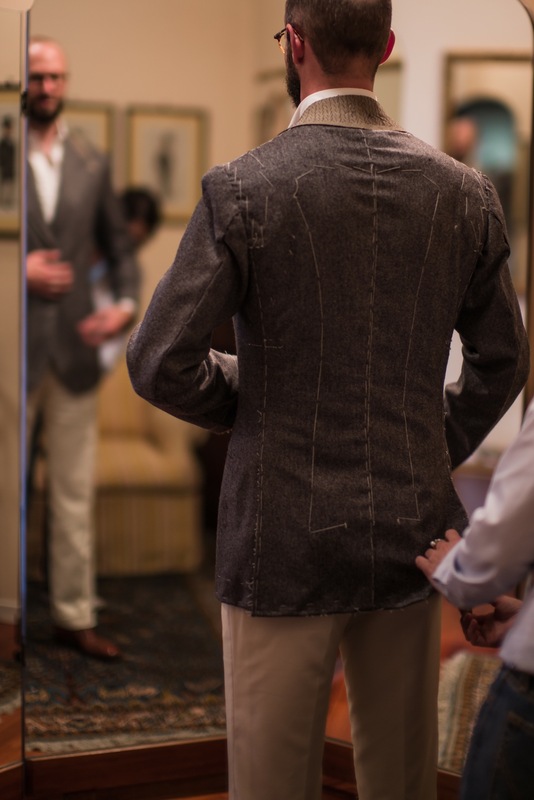 With fittings at 10am and 4pm, the jacket cannot be advanced from a basted to a forward stage. But corrections made in the morning can be confirmed and refined in the afternoon, so that when the forward comes it will be pretty-much perfect. I will still require one more visit to Caraceni at some point, but the total number of visits should be reduced by one. Reillo, actually, also did two basted fittings on my second visit to Madrid, while Langa a few blocks further North did a basic fitting in the linen I had chosen, as they had it on site. The Caraceni fitting itself was good, with intense discussion between Nicoletta (pictured top) and her cutter about the minutiae of shoulder size, as well as a familiar debate (for me) about how to cope with my hollow lower back. Perhaps most importantly, I was very happy with the cloth I had chosen – a Cerruti herringbone in salt-and-pepper cashmere (carried by Dugdale). It’s the kind of jacket I should have had made years ago: versatile, mid-weight, equally at happy with jeans or flannels, quietly sophisticated in its cut and cloth; the kind of jacket that will simply look good to most people, and a beautiful slice of bespoke to those that know. A good argument for point 1 in the Five Tips on Bespoke Suits. You can follow the discussion on Ferdinando Caraceni: jacket fitting by entering your email address in the box below. You will then receive an email every time a new comment is added. These will also contain a link to a page where you can stop the alerts, and remove all of your related data from the site. Simon, if it is the kind of coat you should have had made years ago, why did it take so long? 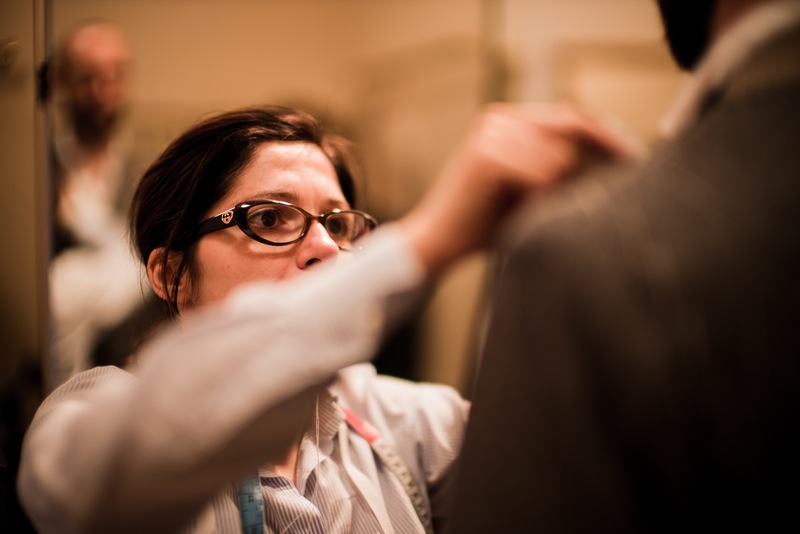 It’s the problem that a few readers alluded to on the ‘Five Tips on Bespoke Suits’ post. It’s very hard when commissioning bespoke to select the most versatile, useful option, because it feels boring. There’s a post here on an ‘essentials’ wardrobe that would include a mid-grey cashmere jacket, a navy two-piece suit, a navy DB overcoat, a tuxedo and so on. Instead of which it’s tempting to order: a brown cashmere jacket, a mid-blue DB suit, a camel-hair overcoat and a velvet jacket. Which is what I did, in various stages. I liked your post about bespoke being for the future, not the past, but I must play the pessimist in the face of your optimism. It’s great that there are writers like yourself, Hugo Jacomet, and Justin Fitzpatrick who are shining lights on craftsmen that, decades ago, likely would have remained regional figures, e.g. Bestetti, Solito, Panico etc. But I think bespoke will continue to be only for a minority of men, and those are the men who really get pleasure from their style of dress. Living in America (outside of Manhattan), it’s becoming normal to meet men who don’t even have ONE suit, and think that totally fine. So taste is surely important, but as long as employers deem it okay for workers to arrive in shorts and t-shirt, the effort to get the masses to go for bespoke is a futile one. But please, you keep writing, because you are doing a great service for what must be a shrinking minority of male clotheshorses!! I think it’s important to think of this as a wider issue than just bespoke. It’s about quality of any type, about buying things that last and looking after them so they do. That trend has been bigger than bespoke in the past few years, and it’s only by continually voting with our wallets – by asking the salesman about the quality, then buying the best quality – that we keep that going. Thanks, it is nice. Worth talking to Dugdale’s about their Cerruti stuff if you get a chance. Thank you for an interesting report. The fabric looks very nice, but seems not available on the Dugdale homepage? 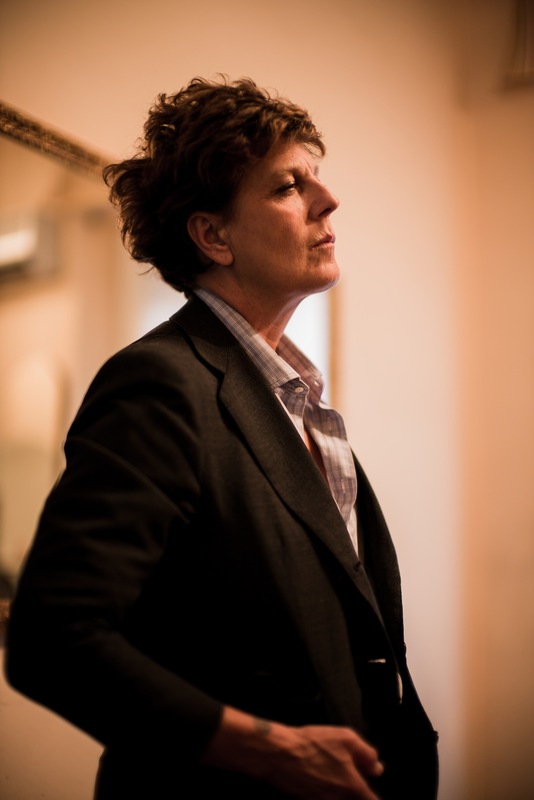 It looks as if the gorge on your lapel will be quite high (same as in the photo of the younger A. Caraceni cutter). Looking at photos of Caraceni jackets (especially Agnelli’s) this doesn’t seem to be the case, even before the low-gorge 80s. Do you know if this is something that has changed in their house style? Hi Simon, I have just order my first bespoke suit last month and about to go for my first fitting (basted I assume). Please can you post some advice on what to look out for / pay attention to? Thanks! It’s not a real second fitting as I mentioned – it’s still a baste. You wouldn’t expect the back to be clean at this point as the structure isn’t in there. That looks like a beautiful jacket in the making. Slightly off-topic — I am hoping to have a grey flannel suit made up in the near future. I am considering Fox Brothers’ mid grey flannel in 13 oz. I have heard some very good things about their flannels. I am, however, wondering whether the mid grey may come out a little too light once made up. Do you by any chance have any views on this, or even better, any experience with this cloth? I have been thinking about getting my first bespoke jacket – it will be a grey sport jacket from Napoli Su Misura. (I have a navy Caruso MTM) . So I am looking for a versatile jacket to wear for years to come. what would a classic Naples style – I am thinking about the length etc. I do like the style of Your Solito jacket – woud it be described as typical? Hi Simon, may I ask what your view is on lapels on single-breasted sports coats? It appears to me that you favour wider lapels on most of the jackets you commission. I just took delivery of a tweed jacket but can’t get used to the 4″ lapel width right now. I’m not as slim as you so would expect to be a candidate for a wider lapel but generally prefer narrower ones. Thanks, I’ll wear it around and see how I get on. I think the buttoning point (three roll 2) is a little high for such a lapel spread. Given that this is bespoke what would you think the response would be if I asked for an inch to be removed? Would it even be possible? Changing the collar width would actually be harder, but also required. Thanks, I should have pointed this out during the basted fitting but being new to bespoke let it slide. Hi, do you know/recommend Carlo Ostellari in Milan?